I selected this office because it reminded me that a benefit of owning a laptop is that the world can be your office — well, maybe not those places under water, but you get the idea. A bag with a protective sleeve and a charge on your battery are all you need to make your way into the streets, parks, porches, coffee houses, and libraries. If you’re in the northern hemisphere, the days are getting longer and warmer and you should consider breaking out into the big blue room. Keep your gear minimal, and enjoy all that nature has to offer. I’ve never been successful at being able to use a laptop outdoors — I need my polarizing sunglasses, which make the screen illegible — but I do take work that I do on paper outside as often as I can. Just another benefit of freelancing from home. I’m with Lori – how do you see the screen outside in bright sunlight? I have tried using my laptop outdoors but it never works unless I’m in deep shade. Which would be lovely if I lived in a warm climate, but, sadly, I don’t. Great idea and I would love to do it but sadly my laptop battery has gone the way that laptop batteries seem to go. Only lasts about 20mins anymore. @Lori and Becky — I talked to my eye doctor about this very issue yesterday. She said that you can have an anti-glare treatment applied to your eye glass lenses that will reduce the amount of glare you see on a computer screen. My husband has the anti-glare coating on his glasses and he said that it does reduce the glare noticeably. So, I asked to have it applied to my lenses and I hope that it works! I love working outdoors. This is my favorite office space ever! You’ve read my mind! 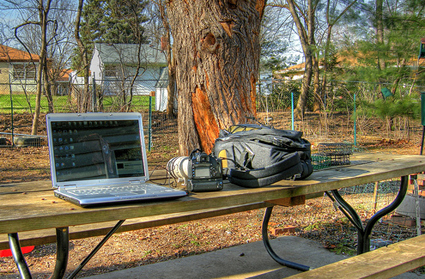 For work, I need to connect via VPN – and obviously find Wi-Fi, but this summer I plan to work on documentation outside. If I am happy, I am more productive – so it is a win-win for my organization!